The Edmonton Oilers might be over in Germany preparing to kick off the start of their 2018-19 season, but there’s still plenty of work to do back home. 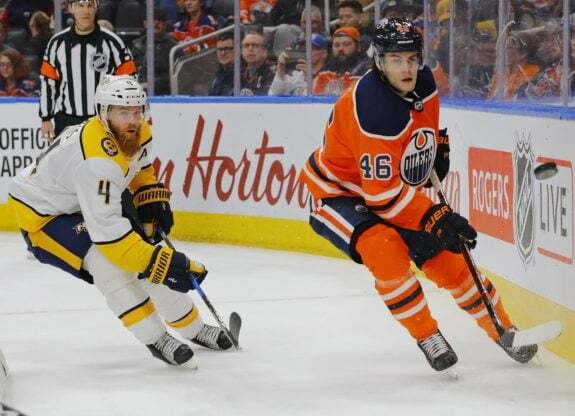 The Oilers were busy waiving defenseman Jakub Jerabek and forward Pontus Aberg after wrapping up their final preseason game in North America. Jerabek has since been traded to the St. Louis Blues, while Aberg has now been claimed off waivers by the Anaheim Ducks. In other news, another former Oiler is making headlines on the waiver wire as well. Sam Gagner, Edmonton’s sixth overall pick in 2007, was placed on waivers for the purpose of re-assignment by the Vancouver Canucks as they trimmed their roster in preparation for opening night. Would the Oilers take a trip down memory lane and snag the now 29-year-old to shore up their forward depth? * Note: Shane Starrett will likely be re-assigned to the AHL, while Jason Garrison and Alex Chiasson await a decision on whether they’ll be awarded contracts after their respective professional tryouts (PTO’s) conclude. 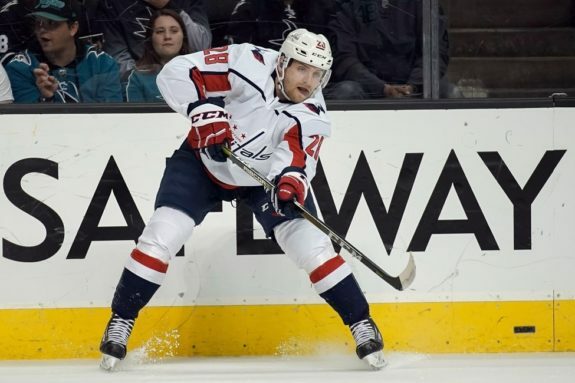 We’ll start with Jerabek who was signed to a one-year deal worth $1 million shortly after the club announced that Andrej Sekera would be out indefinitely with a torn Achilles. Jerabek, 27, was competing for one of the No. 6-7 jobs on the Oilers backend, but was beaten out by the likes of Ethan Bear, Evan Bouchard, and Jason Garrison. The thought process was that Jerabek’s puck-moving abilities could give Edmonton a useful player in the bottom-pairing. As preseason progressed, Jerabek ended up being outplayed by those three and found himself as the odd man out. At times he looked slow, struggled to make decisions in the defensive zone, and was being outbattled for pucks. Jerabek’s a one-dimensional defenseman who saved his best for the final preseason game, a 4-3 win against the Calgary Flames. The Czech blue liner played 19:25 in ice-time in a game where Edmonton’s coaching staff essentially rolled all five rearguards after Adam Larsson’s injury. It might’ve been a case of too little, too late as he didn’t get a sniff of power play time to build his case for either of those No. 6-7 jobs. The Oilers vaguely announced that he’d “been released (and was) awaiting assignment.”. That left some confusion. It turns out it might’ve just been a poorly worded tweet. One theory that was put to rest was that Jerabek was placed on unconditional waivers so both sides could mutually terminate his contract. That would’ve allowed the Euro to find employment in the KHL or his native Czech Extraliga among various other options. Whether he would’ve cleared waivers or not, either way, he was likely destined for Europe anyways and wouldn’t have reported to the AHL’s Bakersfield Condors. Instead, Jerabek has now been traded to the St. Louis Blues for a sixth-round pick in the 2020 NHL Draft. The move frees up a roster spot (45/50) and still erases the $1 million cap hit from the books. * Note: Jerabek is essentially a temporary replacement until Carl Gunnarsson returns from injury. In a nutshell, it was a signing that didn’t pan out and but didn’t cost the Oilers anything regarding poor performance during the regular season. You could look at it as a bonus that now instead of having a player on a bad contract, the Oilers have an eventual flyer on a prospect that will join the development system or a future trade chip. From an asset management perspective count this as a win. Suffice to say Pontus Aberg was a bit of a disappointment in Edmonton after looking like a boom or bust acquisition at last year’s trade deadline. At $650,000 per season, best case scenario was that the Oilers were going to end up with a player that was clearly overlooked with the Nashville Predators and could potentially become a player on one of the better value contracts in the NHL. If you remember, he was the return for unrestricted free agent (UFA) center Mark Letestu. The 25-year-old played 16 games for the Oilers last season scoring two goals and eight points while playing on a value deal of $650,000. But it was the inconsistency, the times of looking virtually invisible, and getting into the coaches doghouse that wore out Aberg’s welcome in Edmonton. Things were never the same after he missed that one early morning practice shortly after joining the Oilers. Of the eight points in 16 games Aberg recorded as an Oiler, seven of those game during a four-game stretch. He recorded just one point in the other 12 games. For a player with so much promise, it’s a concern that he’s already moving onto his third NHL franchise within an eight-month timeframe. The tags attached to this player are “frequent healthy scratch”, “fell out with coaches”, “too good for AHL, but not good enough for the NHL”, and “top six upside unfulfilled” among others. At the start of preseason he was pegged as the No. 13-14 forward, and as it turns out, that’s exactly where he ended up. With Edmonton carrying two goalies and eight defensemen, it would’ve been impossible to carry a 14th forward without going over the 23-man roster limit. Now the Anaheim Ducks are hoping they can be the team that gives Aberg the breakout some are still expecting but others feel will never happen. The Ducks are already missing Patrick Eaves, Brian Gibbons, Ryan Kesler, Corey Perry, and Nick Ritchie (unsigned restricted free agent) to start the year, so Aberg should be able to crack their lineup. 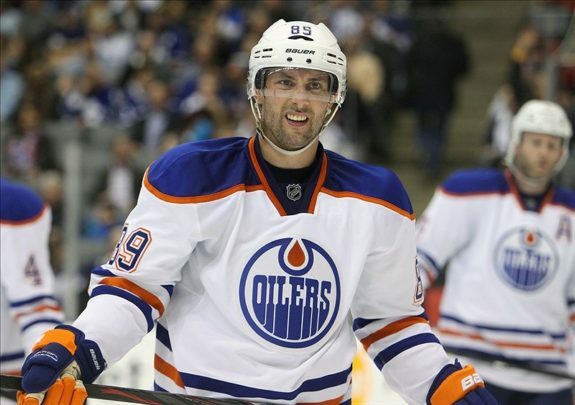 Should the Oilers Claim Gagner off Waivers? 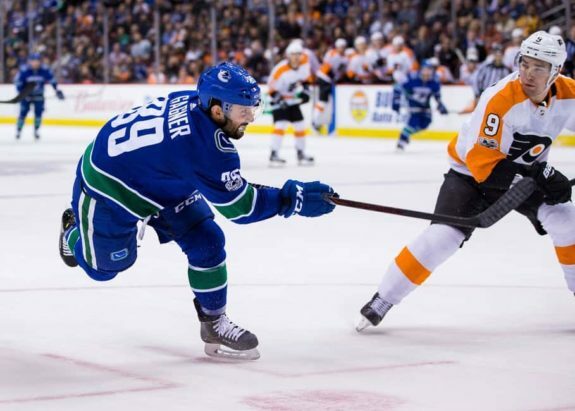 Lastly, on a related note, the Vancouver Canucks have placed Sam Gagner on waivers in hopes someone will claim him before re-assigning him to their farm club, the Utica Comets. The Canucks are now going into 2018-19 without four of their top six scoring forwards from last season. Gone are Daniel and Henrik Sedin, Thomas Vanek, and now Gagner. Edmonton’s sixth overall pick in 2007 has seen his stock drop dramatically after being on the NHL’s best value contract in 2016-17 as a member of the Columbus Blue Jackets when he was earning just $650,000. The 29-year-old had a 50-point season with the Blue Jackets while being a power play ace. It was a career year and the only time he cracked the 50-point marker. He parlayed that into a well deserved three-year deal with Vancouver worth 9.45 million. He registered just 31 points in the first season, and now entering the second, it looks like the Canucks are wanting to move on. Vancouver’s general manager Jim Benning stated in a press conference that they weren’t able to find a deal for Gagner, thus are putting him on waivers. So insert Edmonton. Would the Oilers be interested in going back down memory lane and hoping to rekindle some of the magic Gagner had during his ups and downs in Oil Country? Probably not. A lot that comes down to the cap issues the Oilers have. Right now Edmonton has just $2.74 million in cap space and would need to make a trade with Vancouver (maybe that 2020 sixth-rounder acquired for Jerabek) where the Canucks would retain a heavy portion of Gagner’s contract to make it work. That could be up to the CBA’s maximum of 50% per season. Even at 50%, that deal would still cost $1.57 million against both teams salary cap, and wouldn’t give the Oilers a lot of wiggle room, even once Sekera was officially placed on long-term injured reserve (LTIR). With the roster virtually set at forward, they’d be paying him Drake Caggiula money to be the 13-14th forward. So what’s the point? Once again, the Oilers are going 2-8-13, so claiming Gagner makes little sense. It’s tough to see Gagner fall the way he has. There’s plenty of teams that could use a right shot on the power play like the Arizona Coyotes, Colorado Avalanche, Minnesota Wild, New York Islanders, and New York Rangers among others. Those could be potential landing spots for Gagner. Until then, here’s hoping the former Oiler can find his NHL footing once again.